NORMAN – The Oklahoma baseball team begins its second of back-to-back five-game weeks at home against Texas Southern on Tuesday, March 13 at 6:30 p.m. Game two of the midweek series will be played Wednesday at 6:30 p.m. from L. Dale Mitchell Park as the Sooners are in the midst of a 13-game homestand. Oklahoma is 10-7 on the season, winners of six of the last eight games, following a 3-1 weekend against Texas A&M Corpus Christi. Sophomore catcher/first baseman Brady Lindsly took over the team lead in batting average at .395 with an 8-for-16 series against the Islanders. Junior left fielder Cade Harris is second on the team at .339 with 20 runs and nine doubles; both of which lead the Sooners. Junior right fielder Steele Walker is third with a .313 average as he posted four multi-hit games last week. Senior second baseman Kyle Mendenhall, a .313 hitter, has driven in a team-high 18 runs and is tied for the team lead in home runs at three. Redshirt-junior right-hander Lane Ramsey gets the ball in game one for his second start of the season. On Wednesday, OU turns to junior RHP Kyle Tyler, who pitched out of the Sunday role the last four weeks. He is 0-2 with a 6.14 earned run average and 15 strikeouts. Both games will be broadcast by Sooner Sports TV. Tuesday’s contest will be a SoonerSports.tv feature, available with a premium subscription, and Wednesday’s will air on FOX Sports Oklahoma. Veteran OU broadcaster Chad McKee (play-by-play) and former OU and MLB pitcher George Frazier (color) will be in the booth. Wednesday’s game will also be streamed on the FOXSportsGo mobile app. Audio from the game one broadcast will be shared with radio, while Sooner sideline reporter Chris Plank will call game two for Sportstalk 99.3 FM/1400 AM. The games can also be streamed at Sportstalk1400.com or the Sportstalk page of the TuneIn mobile app. Texas Southern has made two NCAA Regional appearances in the past three years, including the Baton Rouge Regional last season. The Tigers enter the midweek series with a 3-11 overall record. Texas Southern, a member of the SWAC, has played all 14 games of their games on the road this season. Over the weekend, the Tigers opened conference play with a series against Southern (La.) and went 1-1. The offense is led by senior Horace Leblanc, who comes in with a team-best .367 batting average and .426 on-base percentage. Another important piece to the offense is outfielder Christian Sanchez. The junior enters the series hitting .291 with six home runs and 10 RBI. A key reliever for the Tigers is sophomore Robert Loza. He has made 10 appearances and held opponents to a .121 batting average. Sooner quarterback and outfielder Kyler Murray has made the adjustment to center field in his second year on the diamond. Murray, who threw three touchdown passes in only 21 attempts in 2017, has found his knack for the long ball this spring. He is tied for the team lead with three home runs. Murray hit his third of the season vs. Texas A&M Corpus Christi (3/9) for his first career grand slam. The grand slam capped a five-run seventh, that was tied 6-6 when the Sooners came to bat, and stood as the difference in an 11-7 Oklahoma victory. Cade Cavalli has started eight games at first base, two at third, one as the designated hitter and vs. Texas A&M Corpus Christi (3/10) got his first start on the mound. He is hitting .260 at the plate with 10 runs and eight RBI. He hit a home run on just the second pitch he saw in his career vs. Indiana (2/16). Cavalli earned his first win in relief against Valparaiso (2/25). 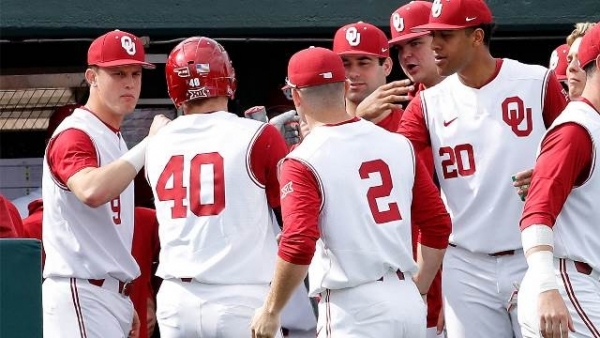 He is the first OU player to homer and win a game in a season since All-American Sheldon Neuse hit 10 home runs and went 4-1 as the Sooner closer in 2016. Jacob Evans also won six games and hit one home run in 2015; having hit a walk-off jack as the winning pitcher vs. Kansas (4/2/15).